ANYONE who doubts the ambitions of China’s airlines need only look over the plans for Daxing International Airport, which will serve Beijing after it opens in late 2019. It will be the world’s biggest airport by far, with eight runways and room for 100m passengers a year. The new facilities are needed to serve a fast-growing appetite for air travel. The three Chinese carriers that will dominate the passenger traffic passing through Daxing’s cavernous halls are all in rapid ascent. And that has rivals everywhere complaining about the sorts of subsidies that have fuelled airlines since the dawn of commercial aviation. China’s airlines are adding passengers at a rate not seen since Emirates, Etihad and Qatar Airways started to attract customers to their Gulf hubs, handily placed between Europe and Asia, with a winning combination of cheap fares and superior service. Between 2010 and 2017 passenger numbers on China’s three biggest carriers grew by 70%, to 339m (see chart). That growth has translated into some financial high-flying. At the end of March China Southern, Asia’s biggest airline, and China Eastern both reported record annual profits. Air China’s share price fell after it announced that it had only made its best profits since 2011. As China’s carriers expand, their Gulf rivals, which for a decade have seen passenger growth of over 10% a year, are languishing. Slower expansion—or in Qatar’s case, shrinkage—has hit profits hard. It is natural to expect China’s carriers to eclipse those from the Gulf, says Will Horton of CAPA, a consultancy. Those Gulf airlines rely on long-haul passengers connecting in their hubs. China’s carriers are built on more solid foundations of fast-growing local demand. A total of 549m passengers took to the air last year, compared with 184m in 2007. The International Air Transport Association (IATA), a trade group, predicts that China will overtake America as the world’s biggest aviation market by 2022, and will go on to hit a total of 1.5bn passengers by 2036. Much of that growth is on international routes. Over the past decade airlines in mainland China have opened over 100 new long-haul routes. These flights mainly serve an increasing urge among Chinese for foreign travel. The number of tourists going abroad, mostly by plane, has rocketed in the past decade, from 41m a year to over 130m. As a result, Chinese airlines are gobbling market share, says Dave Emerson of Bain & Company, a consultancy. Between 2011 and 2017 the capacity on Chinese planes flying between China and America rose from 37% to 61%, reckons OAG, a flight-data firm. The battle to fly the Chinese around the globe is not the front that most concerns the world’s other big international airlines, however. The Gulf carriers took business from American and European airlines by getting the world to fly through their hubs. 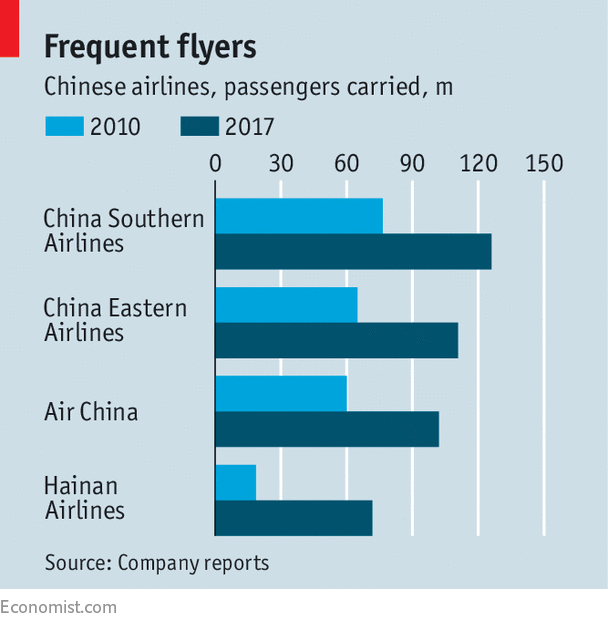 Chinese airlines are also now making the most of their location, and the largesse of the state, to offer connections to destinations beyond their home market. Chinese regulators limit competition on domestic routes, allowing airlines to make healthy profits to cross-subsidise loss-making international routes chosen to reward allies such as Cuba. China’s smaller cities also give handouts to airlines (around $1.3bn in 2016) to launch new long-haul routes from their airports. All this has created more seats than locals can fill. So the carriers are selling them cheap to foreign travellers looking for a long-haul bargain, explains Mr Horton. The Chinese authorities encourage the practice. They are, for example, loosening immigration checks on connecting travellers and giving some visa-free access to China for six days. This is hitting regional rivals hardest. Many Asian carriers were struggling long before the threat from Chinese airlines arose. Carriers such as Malaysia Airlines had allowed costs to run out of control, thanks to poor management and political meddling. But since the visa rules changed, even comparatively well-run airlines, such as Cathay Pacific, have had to contend with a sea of red ink. Airlines globally may be enjoying an era of record profitability but earnings per passenger for those in Asia have slumped by a sixth since 2015, according to IATA. Airlines in America and Europe have less at stake, even if many are already nursing losses on their Chinese operations. But coming on top of competition from low-cost rivals and the Gulf carriers, the arrival of the Chinese acts as another spur to calls for protectionism. America’s three biggest carriers want the “open-skies” agreements that enable the Gulf carriers to fly to America revoked. In Europe, Air France-KLM and Lufthansa have been lobbying for a proposed reform of Regulation 868, which would allow the EU to impose sanctions on foreign airlines that get state subsidies. These tactics will not work on China, warns Andrew Charlton of Aviation Advocacy, a consultancy. Unlike the Gulf states, China is an emerging superpower. It has the power to hit competitors where it hurts. Last June it fined Emirates 29,000 yuan ($4,270) and banned it from expanding in China for six months on trumped-up charges over safety lapses. A trade war over flying rights will hit the West harder than China, which is fast becoming a sizeable exporter of tourists. Foreign airlines may yet get some respite. The growth in international passengers on Chinese carriers is already slowing, from a breakneck pace of 33% in 2015 to a merely rapid 12% forecast for this year. Many politicians are starting to ask whether some of the subsidies are value for money. And Chinese regulators are belatedly liberalising the domestic market by giving up their control of fares, potentially leaving carriers with less spare cash to subsidise foreign operations. Some smaller airlines are already hitting financial trouble. Hainan Airlines, the country’s fourth-largest carrier, looks wobbly and its owner, HNA Group, is struggling to pay creditors. And foreigners have ways to fight back. Qantas and Singapore Airlines, for example, are keen to use ultra-haul-long direct flights to attract business travellers keen not to have a layover. The take-off of Chinese airlines looks unstoppable. That does not make them invincible.